11.3 How do I want to teach? Of all the nine steps, this is the most important, and, for most instructors, the most challenging, as it may mean changing long established patterns of behaviour. 11.3.1 How would I really like to teach this course? This question asks you to consider your basic teaching philosophy. What is my role as an instructor? Do I take an objectivist view, that knowledge is finite and defined, that I am an expert in the subject matter who knows more than the students, and thus my job is to ensure that I transfer as effectively as possible that information or knowledge to the student? Or do I see learning as individual development where my role is to help learners to acquire the ability to question, analyse and apply information or knowledge? Do I see myself more as a guide or facilitator of learning for students? Or maybe you would like to teach in the latter way, but you are faced in classroom teaching with a class of 200 students which forces you to fall back on a more didactic form of teaching. Or maybe you would like to combine both approaches but can’t because of the restrictions of timetables and curriculum. Chapters 2, 3 and 4 set out some of the choices available to you in deciding how you want to teach, in terms of overall philosophy. 11.3.2 What’s wrong with the way I’m teaching at the moment? Another place to start would be by thinking about what you don’t like about the current course(s) you are teaching. Is there too much content to be covered? Could you deal with this in another way, perhaps by getting students to find, analyse and apply content to solve problems or do research? Could you focus more on skills in this context? If so, how could you provide appropriate activities to enable students to practice these skills? How much of this could they do on their own, so you can manage your workload better? Are the students too diverse, in that some students really struggle while others are impatient to move ahead? How could I make the teaching more personalised, so that students at all levels of ability could succeed in this course? Could I organise my teaching so that students who struggle can spend more time on task, or those that are racing ahead have more advanced work to do? Or perhaps you are not getting enough discussion or critical thinking because the class is too large. Could you use technology and re-organise the class differently to get students studying in small groups, but in such a way you can monitor and guide the discussions? Can you break the work up into chunks that the students should be able to do on their own, such as mastering the content, so you can focus on discussion and critical thinking with students when they come to class? For instance, by moving a great deal of the content online, maybe you can free up more time for interaction with students, in large or smaller groups, either in class or online, and at the same time reduce the number of lectures to large classes. 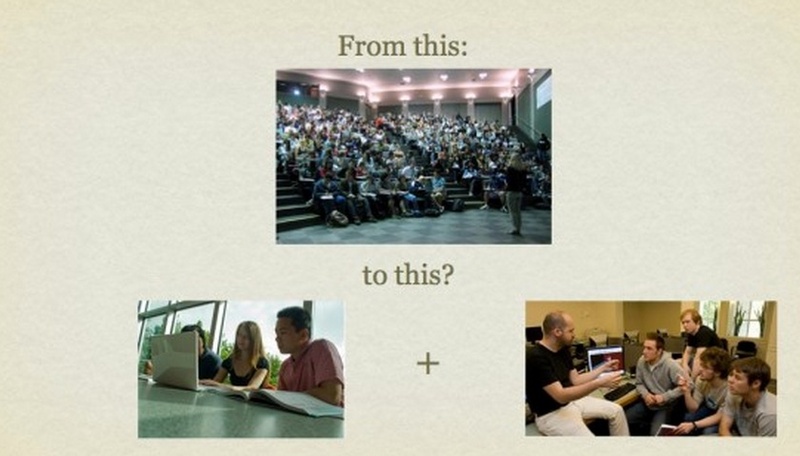 Some instructors have redesigned large lecture classes of 200 students, by breaking down the class into 10 groups, moving much of the lecture material online, and then the instructor spends at least one week with each of the 10 groups in online discussion, interaction and group activities, thus getting more interaction with all the students. In another context, do you feel restricted by the limitations of what can be done in labs or workshops, because of the time it takes to set up experiments or equipment, or because students don’t really have enough hands-on time? Could I re-organise the teaching so that students do a lot of preparation online, so they can concentrate in the lab or workshop on what they have to do by hand. Could they report on their lab or workshop experiences afterwards, online, through an e-portfolio, for instance? Can I find good open educational resources, such as video or simulations, that would reduce the need for lab time? Or could I create good quality demonstration videos, so I can spend more time talking with students about the implications? Finally, are you just overloaded with work on this course, because there are too many student questions to be answered, or too many assignments to mark? How could you re-organise the course to manage your work-load more easily? Could students do more by working together and helping each other? if so, how would you create groups that might meet this goal? Could you change the nature of the assignments so that students do more project work, and slowly build e-portfolios of their work during the course so you can more easily monitor their progress, while at the same time building up an assessment of their learning? Considering using new technologies or an alternative delivery method will give you you an opportunity to rethink your teaching, perhaps to be able to tackle some of the limitations of classroom teaching, and to renew your approach to teaching. One way to help you rethink how you want to teach is to think of how you could build a rich learning environment for the course (see Appendix 1). Using technology or moving part or all of your course online opens up a range of possibilities for teaching that may not be possible in the confines of a scheduled three credit weekly semester of lectures (see Chapter 4). It may mean not doing everything online, but focusing the campus experience on what can only be done on campus. Alternatively, it may enable you to totally rethink the curriculum, to exploit some of the benefits of online learning, such as getting students to find, analyse and apply information for themselves. Thus if you are thinking about a new course, or redesigning one that you are not too happy with, take the opportunity before you start teaching the course or program to think about how you’d really like to be teaching, and whether this can be accommodated in a different learning environment. It’s not a decision you have to make immediately though. As you work through the nine steps, it will become easier to make this decision. The important point is to be open to doing things differently. Chapter 4 and Chapters 9 and 10 suggest a variety of approaches to teaching that might fit with the answers to some of these questions. However, you can be sure of one thing. If you merely put your lecture notes up on the web, or record your 50 minute lectures for downloading, then you are almost certain to have lower student completion rates and poorer grades than for your face-to-face class. I make this point because it is tempting for face-to-face instructors merely to move their method of classroom teaching online, such as using lecture capture for students to download recorded classroom lectures at home, or using web conferencing to deliver live lectures over the internet. However there is much evidence to suggest that doing this does not lead to good results (see for instance, Figlio, Rush and Yin, 2010). The problem with just moving lectures online is that it fails to take account of a key requirement for most online learners: flexibility. When students are studying online, their needs are different from when they are in class. Restricted ‘office hours’ when the instructor is available for students do not provide the flexibility of contact that students need when working online. Students tend to work in smaller chunks of time when studying online, in several short bursts, and rarely more than an hour without a break. Online work then needs to be broken up into manageable ‘chunks.’ A synchronous web cast may be scheduled at times when online students are working. More importantly, online learning allows us to deliver content or information in ways that lead to better learning than through a one hour lecture. Thus it is important to design teaching in such a way that it best suits the different modes of learning that students will use. Fortunately, there has been a lot of experience and research that have identified the key design principles for both classroom and online teaching. This is what the next eight steps are about. Technologies and new modes of delivery open up wonderful opportunities to rethink completely the teaching process. Teachers and instructors with deep knowledge of their subject can now find many unique and exciting ways to open up their teaching and to integrate their research into their teaching. The main restriction now is not time nor money, but lack of imagination. Those with the imagination will be able to fly into previously unthinkable ways of teaching their subject. 3. Now think whether, by moving a course online, you could teach in new ways that better fit your philosophy of teaching, with the increased flexibility of access and the resources available through the Internet. What would your teaching approach now look like? 11.3 Step One: Decide how you want to teach by Anthony William (Tony) Bates is licensed under a Creative Commons Attribution-NonCommercial 4.0 International License, except where otherwise noted.